Paul Greengrass’ docu-realism modus operandi is in full effect in this picture, like Bloody Sunday and United 93, capturing the true-to-facts story of Somali piracy victim Richard Phillips as genre entertainment told with docu-style realism. 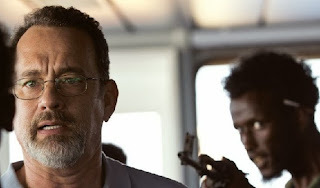 Despite the wattage of Hanks, Captain Phillips is the lesser of these three pictures, faulted by a murky socio-political theme. The brilliance of Bloody Sunday and United 93 were each film’s ability to create suspense and terror out of the procedural details of a real-life dramatic situation. We were saved from the melodramatic trappings character arcs, familiar screenwriting 101 structure and those familiar faces which change our perspective on unfolding drama. By the very nature of having the wholesome figure of Tom Hanks as the hero in Captain Phillips we’re never really put into the same kind of realism at the others. But Greengrass tries his best, and by the end, the film floats up to somewhere in between United 93/Bloody Sunday and the flawed by enjoyable Green Zone. Phillips, introduced driving to the airport with his wife (Catherine Keener sadly with little to work with than playing a wife to Tom Hanks), is a humble working class family man, working around the world, away from home, simply to make a living. Phillips' ordinary, unassuming personality and background aids in making his ultimate escape from his harrowing kidnapping ever the more impressive. Everyone knows Somalis pirates troll the areas around the Africa coast, and for Phillips it’s unavoidable. As soon as they cross into the danger zone they catch sight of a couple of cheap motorboats cruising toward them. Greengrass choreographs a terrific sequence before the pirates even make it to the ship, highlighting the Phillips ingenuity in this unorthodox chase sequence. With a fake radio communication to himself he fools one of his assailants into thinking military air support has been scrambled. The ships’ meager defence which includes a shield of water hoses staves them off for a time. Greengrass’ expertise in this area involves his attention to the minute by minute details of the chain of events. And like all of his films he finds maximum suspense in this minutae. Eventually the half dozen pirates make it to the ship. The gang of thieves are imposing, espeically the leader Muse despite a meek appearance. As played by newcomer Barkhad Abdi Muse is frightening and unpredictable in a way a recognizable actor could not have been. Despite the film’s intentions to render this story a triumph of a Phillips’ will, the resounding theme which seems to emerge unintentionally is a David and Goliath scenario. By the lengthy but thrilling finale, the freighter is long gone and the fight becomes Muse’ tiny lifeboat vessel trailed by the best and most sophisticated military equipment the US navy has to offer. The visual juxtaposition of the lifeboat against the imposing figure of the US Carrier or the lowly pirates scoped in the high tech Navy Seal sniper sights is what this film comes down to. This is a powerful motif which Greengrass never quite capitalizes on. With the massive military presence almost every step of the away nearby we never get the feeling of Phillips’s isolation, instead the inevitability of Muse’s downfall. But even after the film is over Greengrass lingers with Hanks, almost dismissing Muse’ strangely impressive feat. Thus, what Greengrass misses is making the film about Muse, and his desperation and hubris into going up against these massive American ships.There’s a fascinating character study missed in between the picture’s adultation for Phillips. Having cited this fault, the picture is still an at times mesmerizing piece of cinema. Typical of the director’s work, the broad canvas of the action is shrunk as the film moves along to a hyper-intense moment of conflict and tension. In United 93 it was the passengers’ desperate attempt get into the cockpit and take control of the plane, here it’s the snipers’ need to put the Somali pirates into their sights in order to take them all out at once before Phillips is killed off. Though we know the outcome it’s still a heart racing experience.